Here at Yarwoods Excavator Attachments Ltd we are specialists in all demolition equipment sales in Scotland, North West, North East and all over the UK. With over 40 years of experience, we have the expertise to supply your business with the industry leading, highest performing and cost effective quality products that are built to both perform and stand the test of time. We are the only authorised UK importer of TOKU Hydraulic Hammers and HARTL Crusher Buckets and Screener Buckets. Additionally, Yarwoods together with KINSHOFER and Demarec have signed an exclusive supplier dealership to cover all of Scotland and the North East of England down to Derbyshire. Our selection of quality demolition equipment includes: Hydraulic Hammers, Multi Quick Processors, Pulverisers, Dedicated Shears, Selector and Demolition Grabs, Timber Grabs, Clamshell Buckets, Compaction Plates, Riddle Buckets, Ripper Tooth, Rakes, Pallet Forks, Magnets, Crusher Buckets, Pile Croppers and more. Our demolition grabs have heavy duty perforated shells letting fine dust & gravel through without large pieces getting caught. Kinshofer & Demarec’s range of demolition grabs fit machines with operating weights from 1ton through to 80 tons, available with heavy duty perforated or ribs. We also provide Demolition Shears, a very popular tool in all industrial demolition sites for cutting metal materials such as section bars, pipes, H-beams, tank, railway carriages, etc. Here at Yarwoods we have a great reputation for excellence in service and product reliability. We will go the extra mile to ensure that any demolition equipment you purchase from us will give 100% satisfaction. 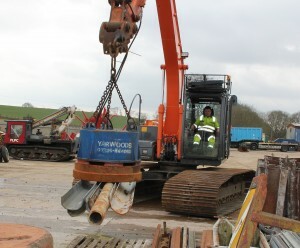 For all of your demolition equipment sales needs in the UK look no further than Yarwoods. We provide demolition equipment sales services throughout Scotland, North West, North East and the UK as a whole, including Glasgow, Edinburgh, Lanarkshire, Inverness, Newcastle, Yorkshire and Carlisle and many more.